Join us at our Studio Pilates classes in Melbourne CBD, Richmond or Moonee Ponds. From first timers to elite athletes, join us to experience movement for life. If you’re seeking quietness, space and time to work on your physical health and mental wellbeing then our Melbourne studio is for you. Situated in the heart of Melbourne CBD, our Melbourne Pilates studio is light and bright. You will draw energy from our light-filled Richmond studio. Here, the teachers radiate energy, enthusiasm and experience. They don't just teach Pilates, they care for your mind and body as they form a beautiful connection to enhance your wellbeing. At our Moonee Ponds studio, the Pilates Method is movement for life. With a focus on actively challenging all joints, through their full range of movement, they provide the ideal environment to begin your Pilates journey while also helping with the prevention and treatment of musculoskeletal injuries and conditions. Here at Aligned for Life Pilates, we not only offer Pilates classes to all ages, levels, and capabilities, we also provide national government accredited teacher training qualifications. So, if you have aspirations to become a teacher and join the Australian Pilates industry, we will help you get there. Our Melbourne educational centre is a hive of activity. We actively foster the growth and development of Pilates teachers – from student right through to the Pilates professional. 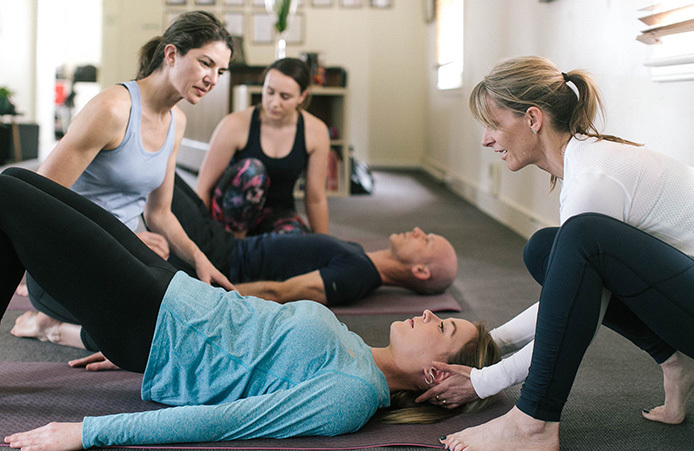 Covering a broad range of topics, our specialists have the experience required to develop and build clinical Pilates specific knowledge skills and understanding. With flexible government accredited qualifications, short courses, workshops and masterclasses, our National Pilates Training centre is actively creating the Pilates teachers of the future.